The all-new 2017 BMW 5 Series sedan debuted a couple of months ago to remind everyone that Clive Owen isn’t in enough movies anymore, and now here’s the wagon, or “Touring” variant. But you can only get it in Europe. And you apparently have to scuba dive. Sorry. 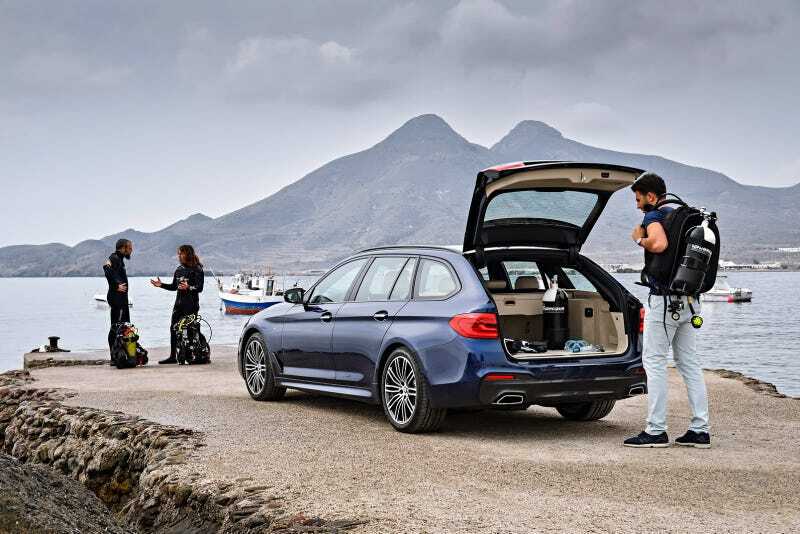 So, yea, if you’re in Europe, the new 5 Series Touring (see: wagon) will launch in June with two petrol (see: gasoline) engines, and two diesel options. The 530i gets a 2.0 liter turbo four-cylinder with 248 horsepower and the 540i xDrive gets 335 horsepower 3.0 liter six-cylinder. The 520d gets a 187 horsepower 2.0 liter four-cylinder and the 530d gets 3.0 liter six-cylinder with 261 horsepower and a whopping 457 lb-ft of torque. All with an 8-speed automatic transmission. It also gets the fancy new 5 Series upgrades including semi-autonomous capability, a new heads-up display, gesture control, and a bunch of other stuff that isn’t going to help you underwater, you know, while you scuba dive. In Europe.